Have you entered into the drawing yet for a chance to win a copy of Simply Sugar and Gluten-Free by Amy Green? If not, check out the details here. The giveaway is open until midnight April 23, 2011. Last weekend, we finally were able to pick up our long-awaited lamb from Good Earth Organic Farm. This is our third lamb we’ve ordered from Good Earth. It’s completely grass-fed and organically-raised, and lived its life less than an hour away from my home. Good Earth Organic Farm has practiced organic, sustainable farming for more than 2o years, long before the resurgence in local/organic/sustainable food began. That is to say, they know a few things. Over the past few years, we’ve been slowly moving towards eating more organic, local, and sustainable foods in our home. At first, it was about taste. I could get fresher foods by visiting the farmers market and buying in season, and fresher foods meant tastier foods. Then, as I grew to know the farmers, I preferred to spend my money locally when I could to support local businesses and these local farmers. But I also learned about the work they did and the reasons behind it. Many of these farmers strive to provide healthy, organically-raised produce and animals for their families and their community, not because they make more money (they certainly don’t), not because they gain fame or recognition (most are very modest, down-to-earth folks, many more comfortable out on the farm than in a crowd of people), but because they strongly believe this is the right thing to do – for the Earth, for the health of their family and community, and to know that their animals (if they raise them) were ethically treated. For them, these values were strong enough that they chose to devote their lives to upholding them. Until recently, while I wholeheartedly supported these farmers and the whole notion of eating locally, organically, and sustainably, my actions didn’t always echo that support. Why? To be honest? Convenience and price. Sure, when the farmer’s market was open, I’d shop there first, but often I wouldn’t buy meat (too expensive) and then, I would visit our local supermarket to pick up whatever was on sale that week to round out our meals. This often meant that at least half of our produce was conventionally grown. Our meat? All conventionally grown (with the exception of the lambs from Good Earth Organic Farm), although I would buy from a grocery that labeled their meats with things like “naturally raised”. (Which, mind you, doesn’t mean much, as that term is not regulated.) I would pick up eggs from Jacob’s Reward Farm a good amount of the time, but even this past winter, I slacked on that, as my new job and new commute made it so that I no longer drove right by the farm each day. Again, that convenience factor played heavily into my choices. I’m not saying what I already practiced was bad. I honestly think I was doing a pretty good job of providing healthy foods for our family – almost every meal consumed in our home is made from unprocessed ingredients. We rarely eat out. Unhealthy snacks and treats are kept to a minimum, and vegetables are emphasized and are forever present at each meal. There are no sugary sodas in our home. But I knew that I could do more to help keep our family healthy. Even more so, I needed to open my eyes and become fully conscious of what I was choosing for us to eat. And when I did, those choices became more apparent – I didn’t want us to eat pesticides. Or chemicals. Or hormones. Or animals that were constantly sick and stressed (for lack of a stronger term) because they were raised in CAFOs (concentrated animal feeding operations). Nor did I want to endorse such practices. Instead, I wanted to treat our bodies with respect and intention, and treat our food the same way. I find that when we choose good food – food that is in season and is raised sustainably – I treat it better. I want to respect the ingredients. They are wholesome, and a lot of honest work went into them. It also connects me with the Earth to eat this way, and I find that there is a deep appreciation for what we put on our plates when we are conscious of what we are eating. As a cook in the kitchen, I am inspired by all of this. I was explaining this to my husband the other day as I was packaging leftovers of a fantastic kohlrabi and apple slaw I’d made using local, organic kohlrabi (also raised by Good Earth Organic Farm! ), organic apples, and parsley from my garden. (recipe coming soon!) I feel as though when I buy grocery store conventional ingredients, I just throw something together carelessly. It gets us by, but it doesn’t taste nearly as good, and many times, it’s an uninspired dish. But when I’m presented with the best of the best, I treat it that way – and from my kitchen sometimes comes some pretty darn tasty dishes, if I do say so myself. He echoed my thoughts, saying he noticed that when I took the time to obtain quality food, the quality and creativity of the dishes I created also was greater. (I do have to say, it made me beam to know that he can also see that difference!) That inspiration, brought on by a sense of awareness for our food, the seasons, and the freshness of it all, is definitely an additional motivating factor driving me to not fall into the “convenience-over-quality” or “price-over-quality” trap. Of course, this little rambling of mine isn’t to insinuate how elite we’ve become, or to sound political or extremist. Far from it. I understand that in a real world, not everyone can afford to spend extra on groceries. Especially in an economy that has certainly seen more prosperous times, there are many without work and they are surviving on what little they can manage to scrape together. I get that. But we as a nation spend less of our income on food than just about every other country in the world. In addition, many of us somehow find the money to spend on iPhones, cable television, satellite radio, restaurant food, and many other things we never even “needed” 5 or 10 years ago. We also spend more and more on medical costs. Perhaps instead, we could use some of that money to contribute to our health in the form of quality food? For a good many of us, it’s not about if we can afford it, it’s about the priority we place on our health. Of course, this is about my choices and beliefs and that of my family. I will leave you to do research and make your own decisions if and when you are ready to do so, and I promise I will try not to preach. If you are curious about reading more, however, you might check out Michael Pollan’s In Defense of Food and The Omnivore’s Dilemma, Joel Salatin (which I’m hoping to read soon) or for a more in-the-kitchen view, Hugh Fearing-Whittingstall’s River Cottage Cookbook (which I am reading right now). There’s a lot more out there, but I have enjoyed these because they aren’t preachy or propaganda-like. Okay, that’s enough of that. Back to this lamb. When we picked up the lamb, and I started to load it into our deep freezer, I was getting excited. Chops, and roasts, and more chops…my mouth was watering as I started to imagine all of the delectable dinners to come, and my mind filled with ideas. Then my hands grabbed the package of shanks. This is what we’re eating first, I thought. I could imagine the tender, fall-off-the-bone meat now, bathed in a flavorful sauce, rich but not overly so, letting the lamb flavor shine through. This recipe does a good job of that – imparting a slight sweetness to the meat, due to the cinnamon and prunes, but enough savory notes to balance it all out. Mashed potatoes pair nicely, as does polenta. What’s better – I recently acquired a pressure cooker, which I used for this recipe. Right now, I’m still enamored with the speed in which food turns from raw to delicious with this thing. The pressure cooker made an otherwise all-day affair – these lamb shanks – something I could cook on a weeknight without too much work beyond my normal efforts. The pressure cooker only set me back about $20 – it’s not fancy – but if you don’t have one, simply simmer these in a dutch oven at a low temperature for 2 1/2 hours or until the meat is falling off of the bone. One additional note – I used green garlic in this recipe. Green garlic is simply immature garlic that is similar to green onions. Its flavor is more subtle than regular garlic. If you can’t find this, simply substitute 6 cloves garlic and 6 stems green onions. Also, if you can’t find swiss chard, feel free to substitute another type of greens, such as spinach, collards, or kale. Combine half of the cinnamon, half of the cardamom, 1 teaspoon salt, and 1 teaspoon freshly ground black pepper. Pat lamb shanks dry and season with spice mixture. Heat oil in a large pressure cooker over medium-high heat. Add lamb shanks and brown all over, cooking for about 2 minutes each side. Remove and set on a plate. Add green garlic, reduce heat to medium-low, and saute for 2 minutes. Add tomatoes with juice, broth, prunes, tomato paste, and remaining cinnamon and cardamom. Add saffron and cloves. Increase heat and bring to a boil, scraping up browned bits. Return lamb shanks to pressure cooker. Put lid on cooker and follow pressure cooker instructions on bringing to a medium temperature. Allow to cook at medium for about 30 minutes. Meanwhile, while lamb is cooking, heat oil in a skillet over medium heat. Add chard and saute for a minute. Add a splash of water and cover briefly, for about 2 minutes. Remove lid, stir, and season with salt and pepper. Remove the pressure cooker from heat and allow pressure to come down (again, according to your pressure cooker instructions). Remove lid, and remove lamb shanks from sauce and set aside. Using a hand blender, puree the sauce. Taste and adjust seasoning as needed. Return lamb shanks to sauce – it should still be quite hot, but if it isn’t, return to a burner on low for a few minutes to reheat. 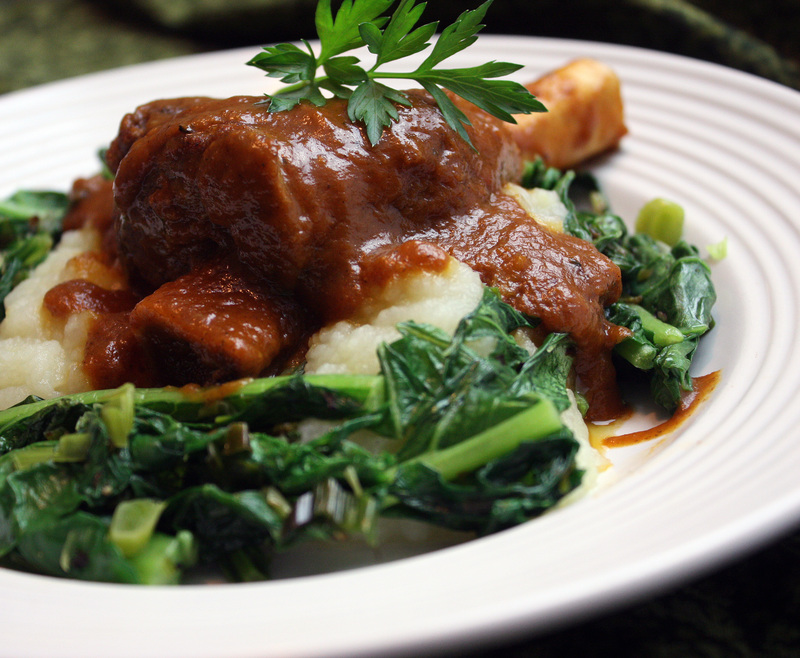 Serve lamb shanks on top of mashed potatoes, if desired, with sauce poured over and swiss chard alongside. Garnish with parsley. You are so thought-provoking…we could all do better, no matter how healthy we eat right at the moment. That lamb looks absolutely wonderful! I think it is so awesome that you made that switch Alta. It isn’t easy to do, but I bet it is so rewarding. Where we live now, there aren’t any local farmers and really, barely any organic meat options, but we are moving to an area with loads of farms, so I’m eager to migrate in that direction too. Maybe then I’ll make this lamb recipe! I completely agree with you about making choices for local, earth-friendly foods. I try and think of it like this: isn’t the most important thing we could be spending money on the FUEL we put in our bodies? We’ve made buying vegetarian-fed, organic, cruelty-free meat more affordable by only eating meat a few days a week. What we do eat, we make really count.